If there is one thing I can always count on my family to eat it is my Cajun food. We love this traditional Southern shrimp pasta recipe in our house! I always make it with large shrimp and smoked sausage. By the way, I like to use Andouille sausage. We recently had some company over for dinner and this creamy sausage pasta became a huge hit! 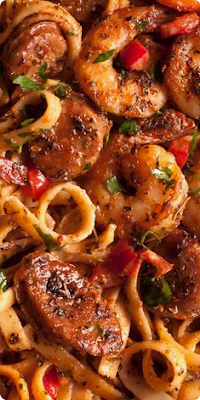 It is a family favorite Southern shrimp pasta recipe! This easy sausage pasta recipe is so vibrant with flavor! And I like that this delicious, creamy shrimp pasta is ready in less than 30 minutes!